"The One with the Bomb"
On Angie Tribeca Season 1 Episode 10 Geils has been kidnapped and the lieutenant is just sick about it. Tribeca will stop at nothing to save him before time runs out. On Angie Tribeca Season 1 Episode 9 A slick band of British gangsters has robbed another bank and the lieutenant is just sick about it. He orders Tribeca and Geils to go deep undercover in order to bust the gang, but when the gang gets busted, everyone ends up in prison. "Murder in the First Class"
On Angie Tribeca Season 1 Episode 8 Another first class passenger arrives dead at LAX and the lieutenant is just sick about it. Tribeca, Geils and Tanner must go undercover aboard the murder flight to catch the killer in the act. On Angie Tribeca Season 1 Episode 7 Tribeca’s been hoarding vacation days and the lieutenant is just sick about it. Ordered to take a day off, Tribeca dabbles in civilian life while Tanner and Geils are out solving a murder on a golf course. On Angie Tribeca Season 1 Episode 6 Illegal pet ferrets are leaking into California and the lieutenant could not be sicker about it. Intent on stemming the flow, Tribeca and Geils follow a trail that leads them to an incredibly high stakes poker game. 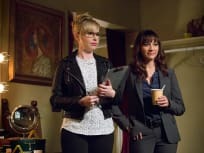 On Angie Tribeca Season 1 Episode 5 Tribeca and Geils are poking around into a prostitution ring and the lieutenant is just sick about it. Afraid of what they might uncover, he orders them to stop. On Angie Tribeca Season 1 Episode 4 a priceless work of art has been heisted from a museum and the lieutenant is just sick about it. Tribeca and Geils search high and low and in the middle to recover the stolen painting. "The Famous Ventriloquist Did It, Not the Young One"
On Angie Tribeca Season 1 Episode 3 a famous ventriloquist has been murdered and the lieutenant is just sick about it. To solve the crime, Tribeca and Geils must dive head first into the salacious, cutthroat world of American ventriloquism. "The Wedding Planner Did It"
On Angie Tribeca Season 1 Episode 2 a baker’s been murdered and the lieutenant is just sick about it. Tribeca and Geils must track down the murderer before any other people get murdered by that murderer. On Angie Tribeca Season 1 Episode 1 the mayor is being blackmailed and the lieutenant is just sick about it. 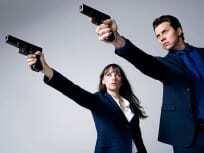 Angie Tribeca is assigned a new partner, J Geils, to find the blackmailer and bring him to justice. The only problem? Tribeca works alone.